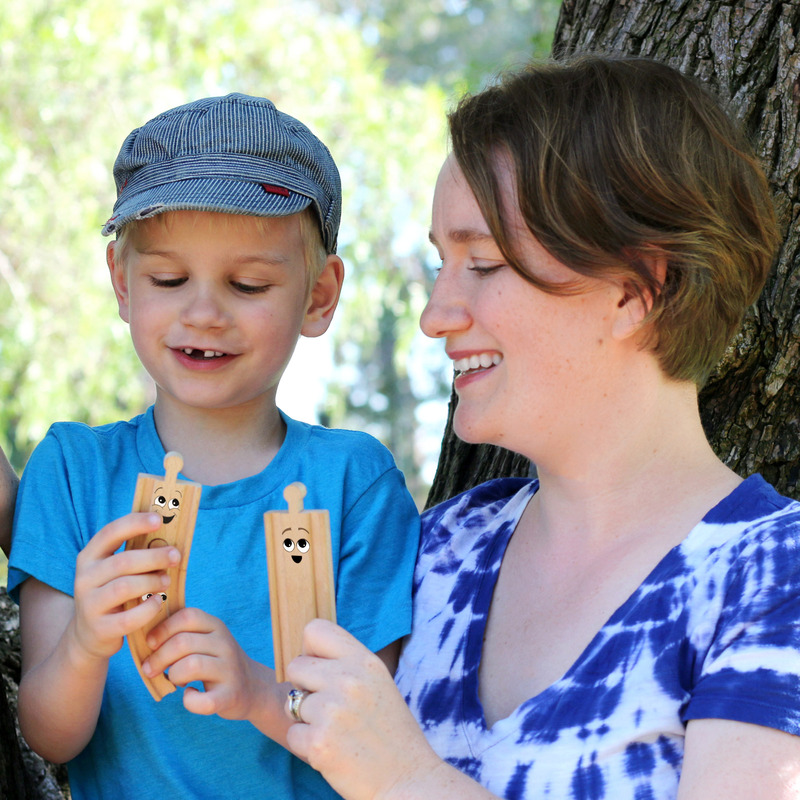 I’m really excited to be teaming up with my blogging buddies again for another round of invitations to play! This time, we’re focusing on Halloween Invitations to Play. Our creative partners in fun are Mary Catherine from Fun-a-Day!, Chelsey from Buggy and Buddy, Stephanie from Twodaloo, Rachael from Nothing if Not Intentional, and Shaunna from Fantastic Fun and Learning. For the first three weeks in October, we’ll all be posting a new Halloween play invitation every Tuesday. 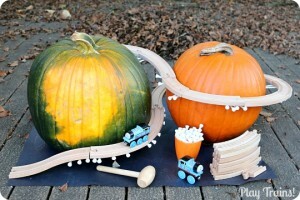 Based on our Fall Invitations to Play series, I can promise you plenty of Halloween fun! 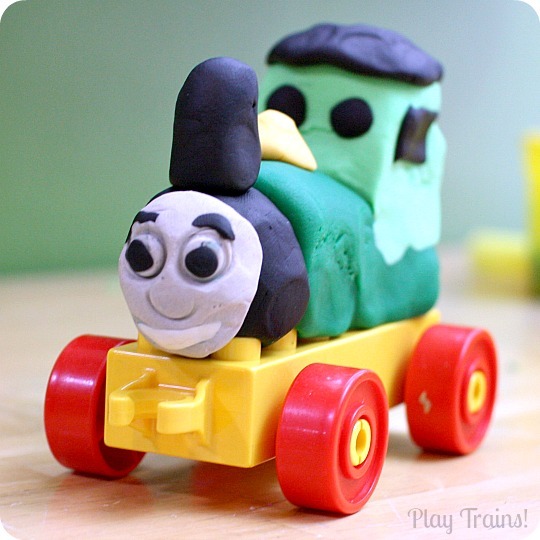 But I think I can claim something close to expert status when it comes to train play. 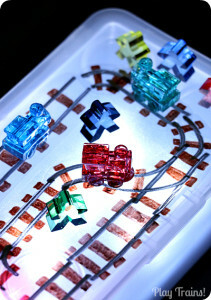 In order to explore what trains really add to this invitation, I made simplicity my guiding concept while creating it. 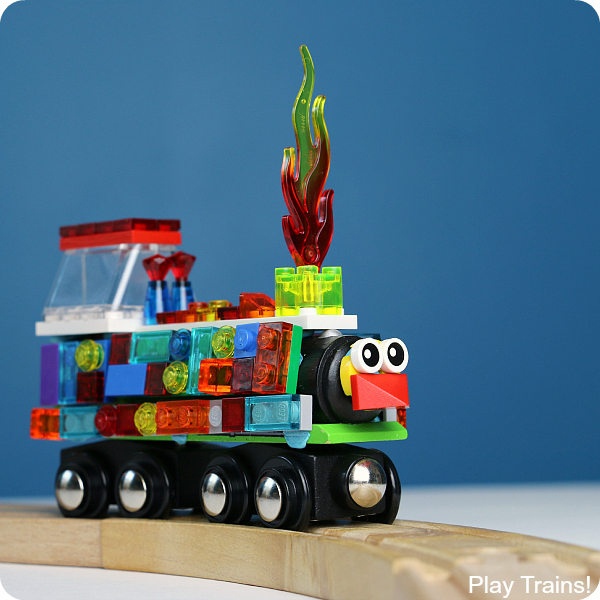 Here are my thoughts after setting up this invitation and watching the Little Engineer play with it. 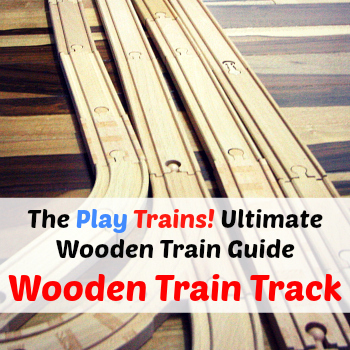 Adding a train and track may encourage a child who loves trains to engage in the activity with more enthusiasm. 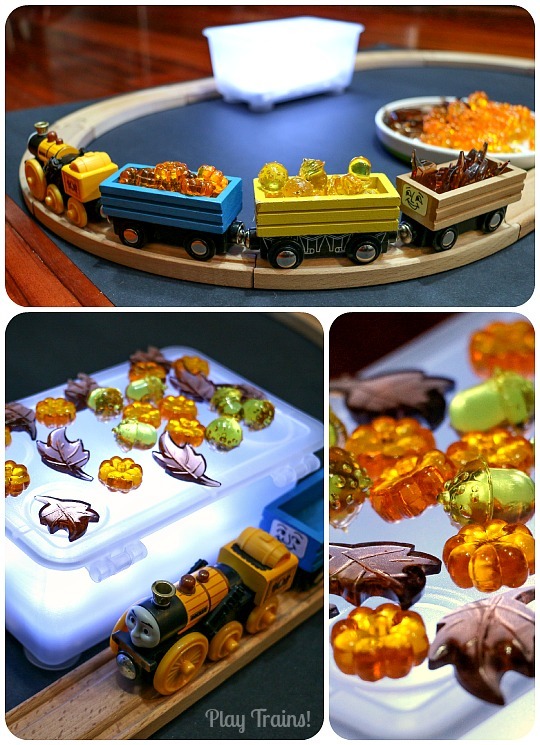 The process of placing the loose parts into the freight cars, rolling the train around the curve without spilling the freight, and then taking it out again to place on the light box increases the amount and variety of the fine motor skill practice encouraged by the invitation. 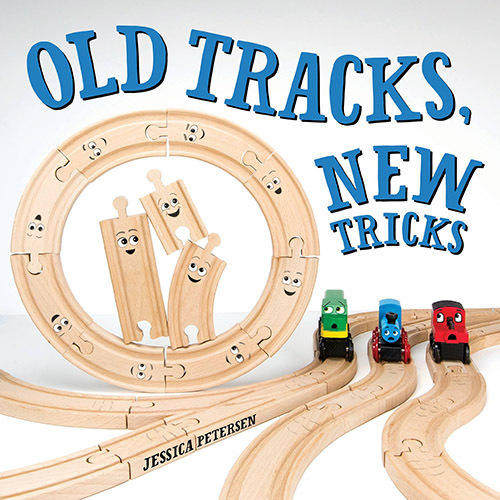 The oval of track suggests a cyclical rhythm to play: after adding the freight to the station, it could be returned to the freight cars and hauled back to the original container, at which point the process could start again. 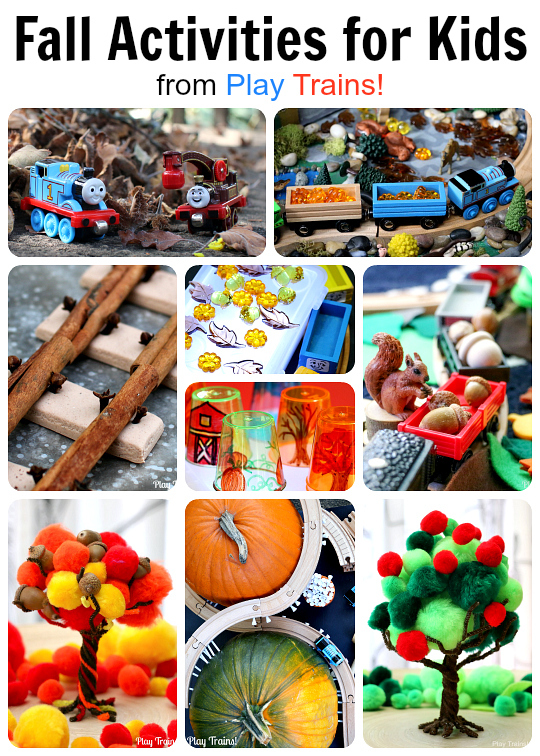 This may prolong a child’s interest in the materials. 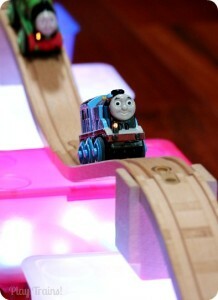 And if a child wasn’t interested in using the train, the loose parts are easily moved closer to the light box. This invitation is a bit more fall than Halloween in some ways. 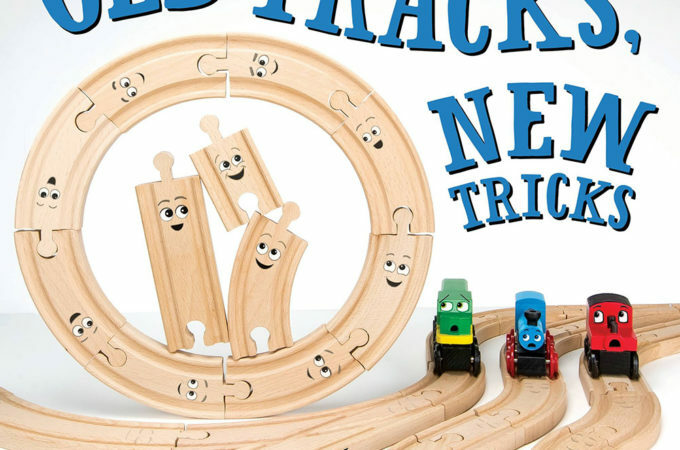 I would have liked to have used some ghosts and done a ghost train invitation, but the Little Engineer wasn’t keen on the idea (despite the recent popularity of the book, Ghost Train, at our house). However, something about the cool glow of the light box shining through the transparent leaves does bring to mind a spooky October night with a chill in the air, especially once the lights are dimmed. I took the idea of a very simple light play invitation — a light box with translucent loose pieces — and added a plain oval of track. 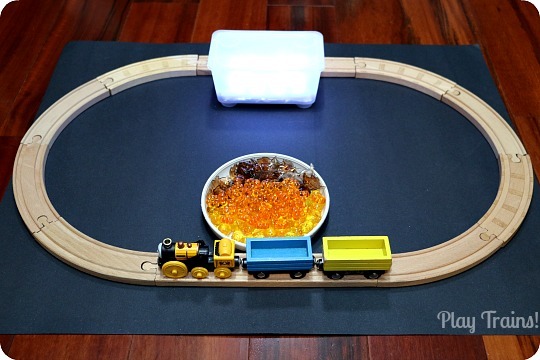 I arranged the fall freight pieces and the light box “station” across the oval from each other, and put the empty freight train on the track next to the freight. 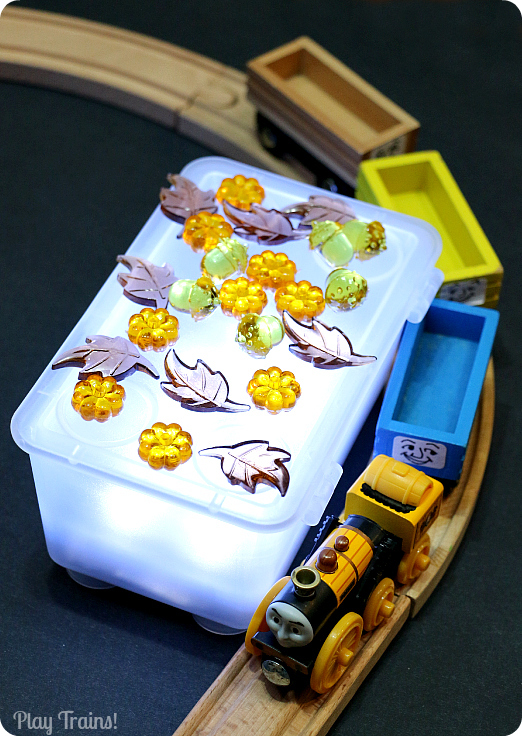 The suggestion to place the freight in the empty freight cars and transport it to the light box is strong, but the child is of course welcome to use the materials in a different way. 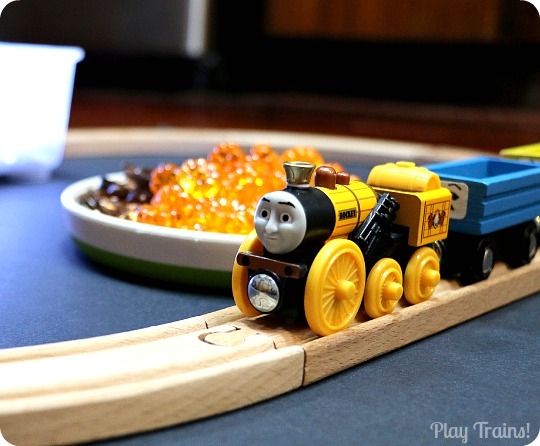 This invitation was pretty familiar territory for the Little Engineer, so I wasn’t surprised that he played with it pretty much how I imagined he would when I set it up. 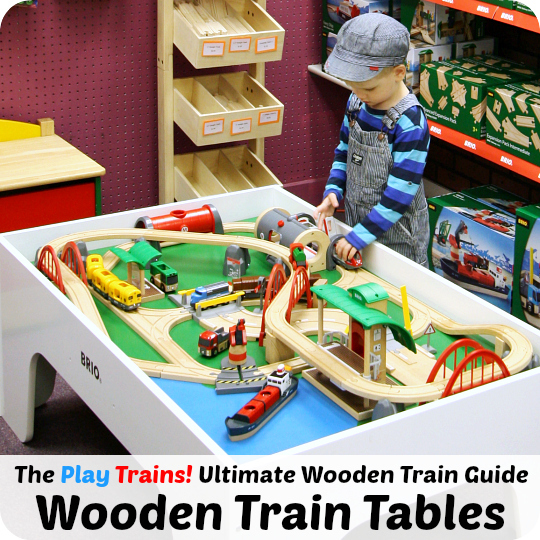 He put the freight into three freight cars, sorting it by type/color, drove it around, and then decorated the “station” with it. The one thing I thought was really cute was he tried to stick the leaf stems up and under the lid, like a garland around the edge of a roof. It didn’t work, but it was fun to watch him try. Now that you’ve read about our activity, you have to go see what my creative blogging friends are posting today! I love the October Moon description–and the pictures look dreamy (as always). 🙂 Very cool! This invitation definitely has a spooky vibe to it but I really like that it’s not scary (with ghosts and witches, etc.). My son would be inclined to suggest decorating the station like your son did. I also like all your thoughts and observations. 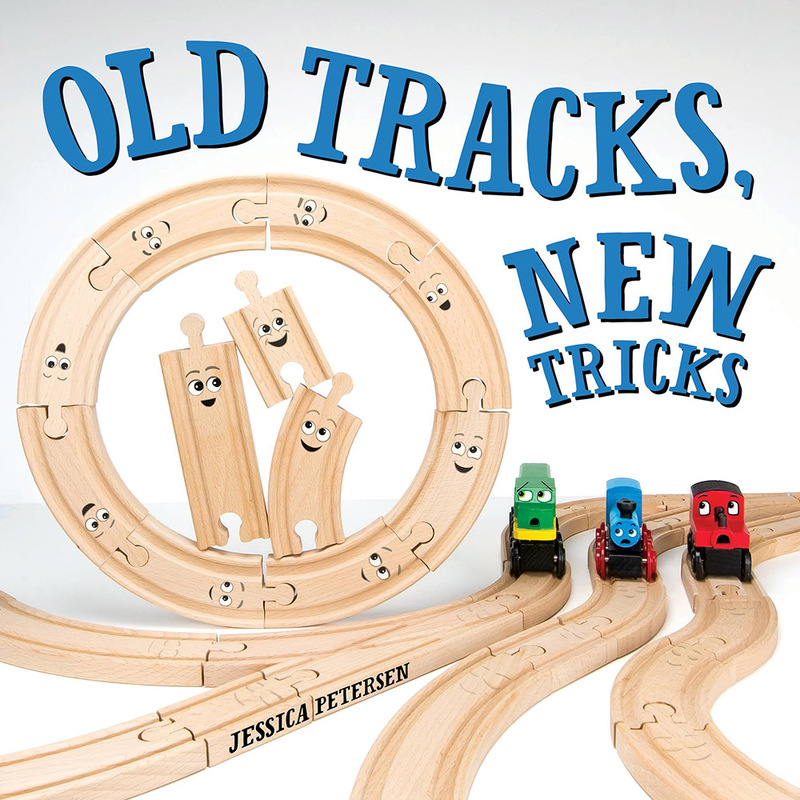 This is such a great example of open-ended play. And you know I LOVE the light box!!! 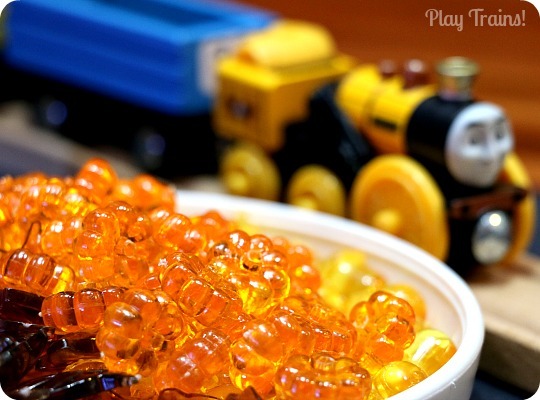 I plan on trying this both at home with my Engineer and at school with my pre-k kiddos. I like that it centers on fall for those children who aren’t into the scarier aspects of Halloween (or those who don’t celebrate it). 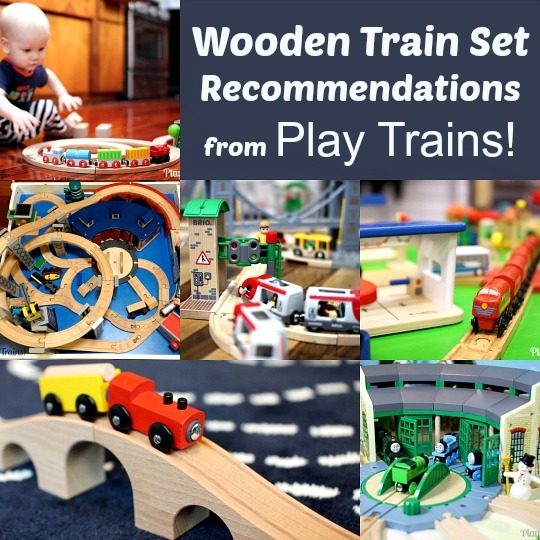 An amazing amount of open-ended play for the kiddos! Love this! 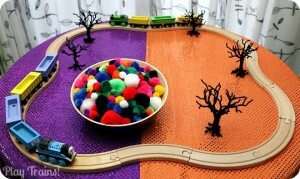 What a fun way to use that table scatter. 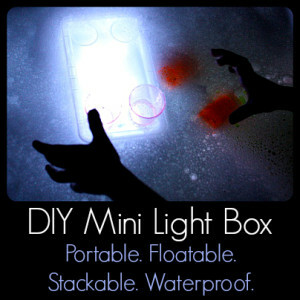 We have a bag full of it waiting to be used ourselves…time to bust out the light panel!